I missed my June date for at least trying to fire up the motor :>( Oh well, I'm not that far away. Unfortunately I will be leaving town for a 3 week seminar beginning July 9th so progress will come to a stand still shortly until the end of July. I was able to get all of the steel fuel, return and EVAP lines installed and bolted to the frame via the factory hold down clamps. 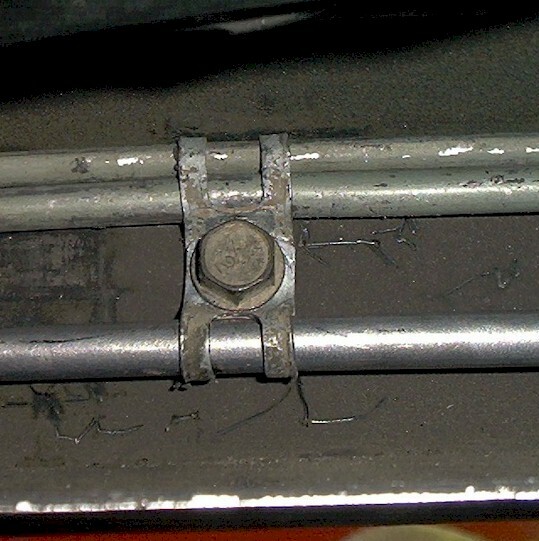 This is a pic of the typical clamp (in this view starting with the top is the brake line, return line and main fuel line). Here is a view of the filter I used (which is the same as the GN/TR and TBI Monte) with the steel lines attached. 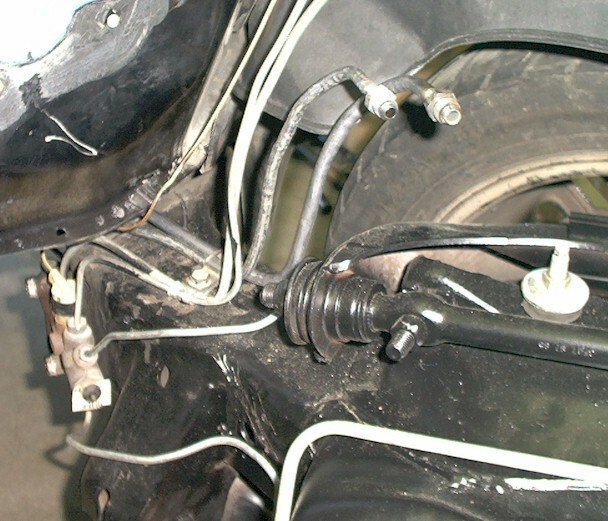 The filter is located on the driver side frame just forward of the front of the lower control arm. 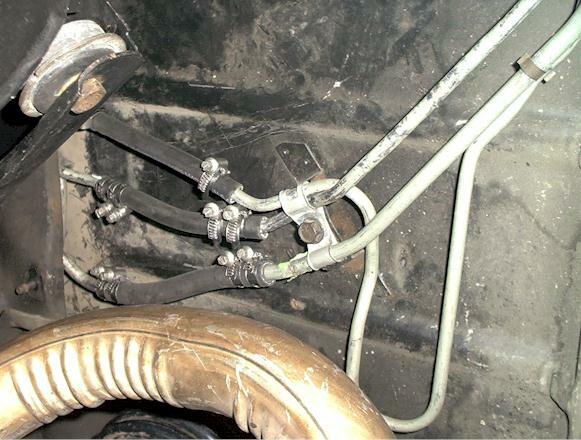 This pic shows the front routing of the fuel lines along the front frame next to the brake proportioning valve. You can see the ends of the fuel lines terminating in the upper right hand corner of the pic. 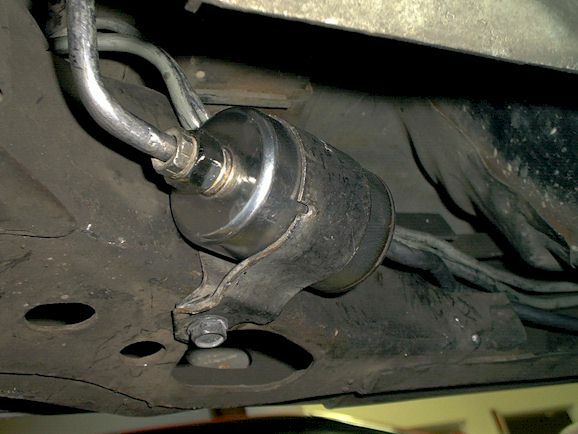 I chose this route to keep the lines away from the drivers side catalytic converter. 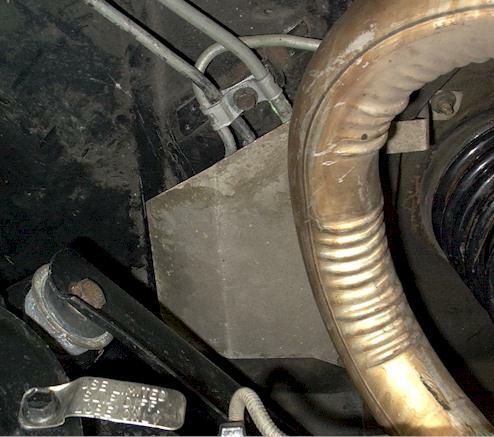 Here is a view of the engine bay ends of the hard lines which terminate directly under the power brake reservoir. The 3/8" supply line is on the right with the 5/16" return line next to it on the left. The flex lines will connect from the fuel rail to the supply lines at this point. 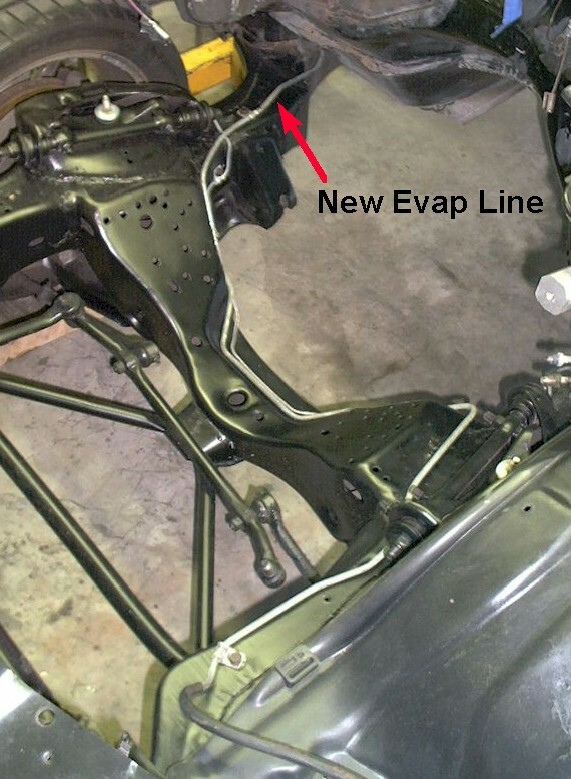 This last view shows the new routing of the EVAP Canister vent line on the passenger side frame then crossing over with the brake line in the engine bay instead being only on the of the driver's side frame rail. These lines are found in mid 1980's Olds, Pontiac & Buick G-bodies. I'll install the fuel pump into the gas tank and get the high pressure flex line to connect the gas tank next. I prepped the Walbro 340 pump and gas tank for final installation. The OEM fuel supply line was severely crimped as it passed through the top of the fuel sending unit housing. I went ahead and replaced this piece with a new 3/8" steel tube soldered in place to eliminate this restriction. I was a little disappointed with the Walbro fuel pump electrical connections because they were not a direct fit with the existing connectors as advertised. I had to cut the connectors off of my TBI pump connections and crimp fit the wire ends to the Walbro connectors to make the electrical connections fit properly. Here is the pump installed to the TBI sending unit with the new pump and screen attached ready to be dropped into the gas tank. 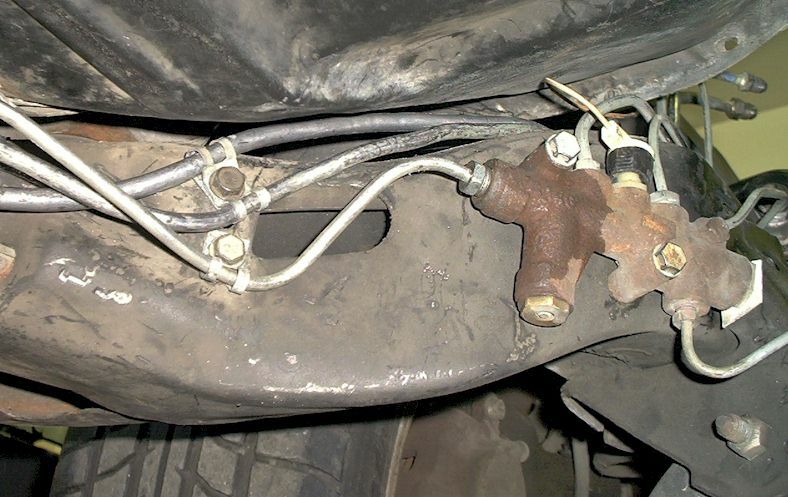 The short middle return line that connects the body mounted solid fuel lines to the gas tank via rubber lines was only a 1/4" diameter line for some reason. I went ahead and formed a new 5/16" diameter line to replace this line. 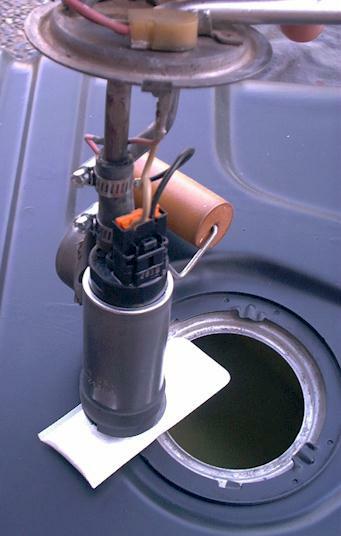 This view shows the fuel line connections from the tank routed and connected to the body mounted hard lines with double clamps for extra safety on the high pressure supply and return lines. Installation of the heat shield to cover the rubber fuel lines connecting directly above the passenger exhaust tailpipe completes the rear fuel system installation except for the wiring. The last remaining item for the fuel system is the wiring and will consist of a new lead running from the alternator via a relay to supply +12V minimum to the electric pump at all times.